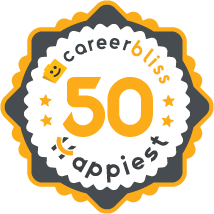 On average, employees at Google give their company a 4.0 rating out of 5.0 - which is 5% higher than the average rating for all companies on CareerBliss. The happiest Google employees are Hardware Operations Technicians submitting an average rating of 4.7 and Software Engineering Interns with a rating of 4.6. "Google is a great place for new college grads where code is fresh in your mind. The interview process is hard but fair so brush up on Binary trees and don't bubble sort! Do not try to bs your way through this interview as they smell fear there and will eat you up. Make sure that if you talk about something on your resume you can back it up because they will grill you. And most of all Practice, Practice, Practice before you decide to apply for a job. Also it is hard to get promoted there as well." "I worked in Google for more than 4 years but after that I feel that I should change my position because I need to gain more experience in Facebook and btw, if you work in Facebook you will get a good salary (twice)." "I worked at Google as a contractor for 2 years. Overall the experience was good. It was a bit of a culture shock as I came from a traditional suit and tie company." "Highly contentious environment with many skill building opportunities, and few, very valuable collaboration opportunities. Management was very green, and appreciation for programmer effort, which only changed after systemic flaws were uncovered." "They installed a gym at the office just because I requested one. I proceeded to use it every day rather than making people feel awkward, as I did yoga or Ido Portal method near the foosball tables. In many ways, it was a nice atmosphere." "Great company if you're an engineer. If you're not then it can be tough to find interesting and challenging roles." "gTech is the worst place to work in Google. Stay away from gTech ads especially. Unless you want to reorg every six months and have to explain what you do to a manager who doesn't care." "Working for Google is pretty awesome in most ways. They make it easy to get stuff done and really strive to build a positive work environment. Everyone is really smart. The downside is that you are a cog in their machine. Most people work on a tiny piece of a tiny piece of the system. Most of the managers in my group are decent, but I'm stuck with a not-so-great one. Being a contractor you get a lot of the day-to-day perks that the employees get, but you are shut out of certain events. I usually don't miss it, though. I get more perks as a contractor at Google than I've gotten as regular employee at other jobs." "Google is a great place to work. The conversion process is, however, unacceptable." "This is an outreach program organized by Google. It's main purpose is to find talented college/university students who are passionate about technology and are knowledgeable about it. These students will be picked to become Google representatives (not employees) in their respective colleges/universities with the following responsibilities: Promote, teach and help adopt Google Services to students, teachers and businesses. Become point of contact between Google and those mentioned above. Organize events inside your respective colleges/universities to either promote the services, teach how to use them or at least use Google's services to help minimize costs and make the event a success. You are there to learn and show the student body that Google is more than a technology company." "Excellent opportunity for open source developers." "Google Summer of Code was an excellent opportunity and programming experience as a college student." "I've been working in Google LA for my summer internship. The people there are all nice to work with. You can learn a lot when you study all the internal tools. You can also balance your life and work easily. I really recommend working in Google!"